I found a solution: telling winhttp to use ie proxy .... yes ! One Note Started synching ! My TIPS for p2p blocklist. A super blocklist made from the most popular ones on the web! 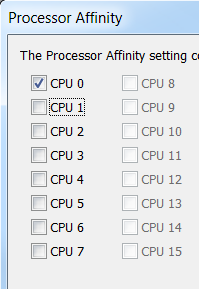 today i'll write a tip about cmd and affinity because nowadays it is common to have multi-core processors, and sometimes we don't want that a process spawn on all the cores. So, in the MS Windows os, you can achieve this by various ways. You can do it with process explorer, just select the process in the list, do a right clic, and then clic on Set Affinity. A multi check box will be presented, then you just have to choose the core you want your process run onto. But this method is noy optimal, because you'll have to do it each time you run your process. Another method is to write a script, or a shortcut, and then launch the process via the cmd program. CMD have an option named Affinity, where you will provide a hexadecimal number wich serve as a mask. Ok, it will work if just have a dual core, or for the first 2 core. But i dislike those article, because a lot of people, including me, first understand that if you want to run the process on core 2, i just have to put the number 3, right ? You will have the process running on core 0 AND 1 ! The reason is because the number you provide is a mask value ! To calculate the result, we have to do a logical AND. To have TRUE, you have to have TRUE AND TRUE. If you have FALSE (0) AND TRUE (1) the result is FALSE (0). If you have FALSE (0) AND FALSE (1) the result is FALSE (0). 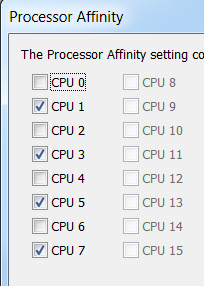 So if you provide 1 to the /AFFINITY, your process will run onto core 0. 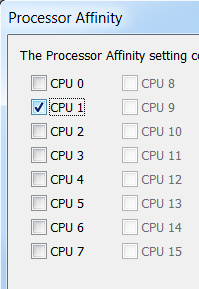 So if you provide 2 to the /AFFINITY, your process will run onto core 1. So here, our process will run onto the first half odd core. I hope this tip by the example will clarify your minds !